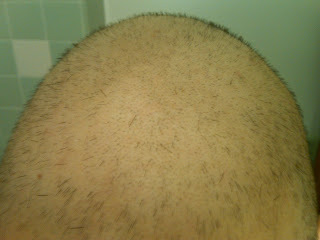 Well, because I shaved my head pretty short a couple of weeks ago, it took longer for my hair to fall out. Still, the inevitable happened today. I could have let it slowly fall out, but I opted to take the time to wipe most of it out at once. Again, I’d rather be in control of the situation. I have to admit though, there is something depressing about losing your hair. I’m not quite sure what it is. I mean, it serves no purpose really – now that we’ve got clothing and hats. Still, each time I rubbed my head and saw an army of hairs speckled on my hand, there was this feeling of loss. Maybe it’s because this hair loss has just been so ingrained in us as a signpost of cancer. It can make you feel like a victim, which is entirely not how you want to feel. The thing is, it’s the chemo that causes the hair loss. And it’s the chemo that’s fighting the good fight. The hair will grow back. The cancer will not. And so, I wouldn’t have it any other way. CLEARLY the STRONGEST MAN I KNOW and LOVE! You have given the phrase " a bad hair day" a new perspective. Me, too. SFC!!! We are all with you! Allison Coutts and student activities folks want you to know that they are all pulling for you in this too! Dean Potash sent me an email as did President Quigley. My friend, Glynn, also sends her prayers and support! My mom is doing a constant novena for you (We refer to her as Pope Pat ~ very connected here). You're an inspiration John. I really can't say it enough. Your positive attitude towards something that most would curl up and cry about is the most amazing thing I have ever seen. When I get angry because tourists complain about their lobster being overcooked (which is impossible) and I want to clock them over the head with a pot, or when I think I'm having a bad day.. I think of you and your strength and I find strength in the moment. Thank you for being a beacon of love and light..
LOveee youuu! Also, heading for the nonviolence institute on sunday and I am so excited to tell you about it!! Love and (clap clap clap) UBUNTU! C'mon '3:10 to Yuma' was awesome. If you're into the old guns it's even better. Travis and I saw 'Taken' a few days ago. Not bad. I'll try and come up with some titles for you. Trouble is you've seen EVERYTHING. Hi John! Sorry I did not write the past few days….I've been on the road off and on but my prayers are ever with you….you know that. And may I confirm the love and support of Cassandra and Patty and Larry and so many friends….I suspect all of those prayers and novenas (Patty's Mom sounds like mine too….it's just that Mom Burns is praying from above) are working many miracles and already are proving efficacious….I am certain of that John….and like Cassandra said, and as we both know, you are strong and focused and seeing the positive responses in your mind, your body, and your soul. However, I must say one thing: I know in a previous message Patty and Lar and several others might have snickered at my partiality to Uncle Buck….I must say, and as Larry demonstrated in his debate last semester, and as you demonstrated in your Advanced Public Speaking class debate (remember, what protects us better? You were superb in your practice run debate: Does a Teddy Bear provide better protection against the Boogeyman than a Blankey?) there are many fine reasons and even evidence that my cinema devotion to Uncle Buck is a necessary antidote to the stresses of this world…for example, it is clear from Norman Cousins book, Anatomy of an Illness, that laughter is essential in healing and restoring health….also, Kathleen Keating's book, The Hug Therapy Book, demonstrated perfectly the need for daily hugging (at least 4 a day!) and Helen Colton's book, Joy of Touching, specifically showed that medical researchers found that when a person is touched, the amount of hemoglobin in blood increases significantly….an increase in hemoglobin tones up the whole body. And, Dr. Herbert Benson, M.D., found in his book, Beyond The Relaxation Response: The Faith Factor, the power of prayer. Thus Uncle Buck loved to laugh, loved to hug, loved to touch, and even prayed when in a jam. So do I! So I am hoping I might have persuaded others to take Uncle Buck more seriously, and to look at the evidence. I know you do John, but I am concerned there is a strong bias against Buck. Perhaps I am wrong, but I felt called tonight to defend Uncle Buck. Needless to say, I am thrilled I am not debating Larry about it….but I feel an open forum on Uncle Buck is called for at the end of the summer. Perhaps Dan can help me…I know he was so devoted to our last forum at your graduation party. Any way, we are all praying John! Just think of Arnold Schwarzenegger saying "collatu-al dahmahge" every time you see some fall out, then a giant explosion with the cancer screaming "nooooooooooooooooooooooooooooooooooooooooooooo!" That should help. I would know. I'm a SCIENTIST!